John Ellis | Saxophonist » MOBRO! Well, I’m finally back from an amazingly productive time as a resident at the 18th Street Arts Center. I had a blast, skipped the brutal NYC winter, got to know LA a little, and wrote as much as I could. Keep an eye out for lots of new music coming your way. 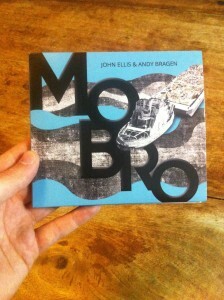 In the meantime, I’m thrilled to be back and gearing up for the release of MOBRO. This has been a long time coming. We debuted this piece in April of 2011 at The Jazz Gallery and recorded that December. I’ve been anxious to share it with everyone ever since. We’re releasing it on my new label, Parade Light Records, on May 13th. Pre-order coming soon!